Mexico is a North American nation located to the south of the US and northeast of Guatemala and Belize. The Gulf of Mexico runs down the eastern coast to the Yucatan Peninsula, where it meets the Caribbean Sea. The Pacific Ocean is to the west with the Baja California Peninsula. The northern border with the US is the world’s second longest at 3,140 km. The official English name of the country is the United Mexican States. There are 31 States and the Federal District of Mexico City. Mexico has the world’s 11th highest population of over 123 million people. 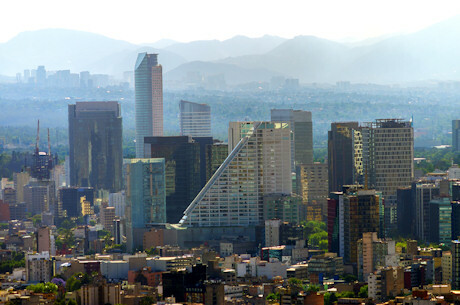 Mexico City is the largest city in the Americas with over 22 million residents. Despite being over 50% desert, Mexico is one the world’s 12 mega-diverse countries due to the wide variety of habitats and its location between Northern and Central/South America. Mexico has 970 species of reptile and amphibian and over 1,000 species of bird including colourful toucans and Yucatan parrots. The Sonoran Desert in Northern Mexico and Southern US is the world’s wettest desert and home to 300 species of cactus and the Mexican grey wolf, ‘el lobo’. The Mesoamerican Coral Reef runs for 1,000 km from Yucatan to Honduras and is a haven for divers and rare hawksbill turtles. Prior to the arrival of Spanish conquistadors, Mexico was part of the region named Mesoamerica which included Belize, Honduras and Guatemala. The Olmecs, living in the Gulf of Mexico from 1400 BCE, were the first major civilisation in the region and carved huge human heads from stone. The Olmecs had 2 calendars of 260 days and 365 days, which ran for 52 years when combined. On the last day they had a celebration and restarted on day 1 for another 52 years. The Mayan long count calendar predicted that the world would end in December 2012. Fortunately they were wrong! The Mayan and Aztecs performed human sacrifices believing that the blood would help the sun to rise. 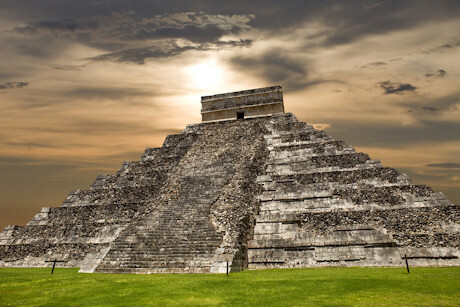 The Mayan city of Chichen Itza is one of the New Seven Wonders of the World. The El Castillo pyramid steps appear to be the body of a snake during the equinox. 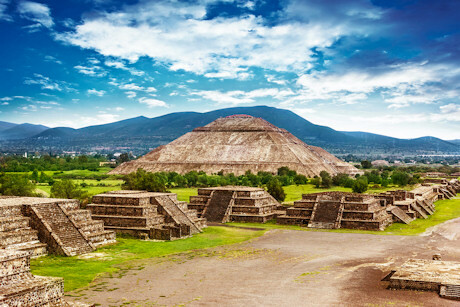 The Aztecs migrated to the Mexican basin in 1325 CE. Spotting an eagle eating a snake, they built their city, Tenochtitlan, on the spot. Unfortunately it was on a swamp, and the modern capital, Mexico City, is sinking slowly. 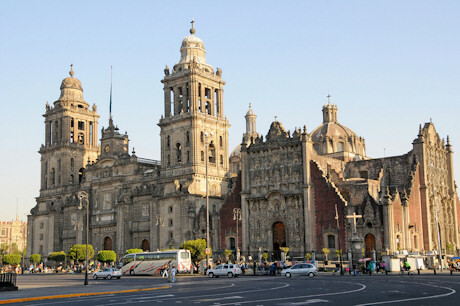 The Catedral Metropolitana in Mexico City is the largest cathedral in the Americas and took 240 years to build. It has 25 bells with the largest weighing 6,900 kg. Football is the national sport, but lucha libre wrestling is very popular. Contestants wear colourful masks. Cuexcomate in Pueblo, at only 13 metres high, is the world’s smallest volcano. Formed in 1664 it is now dormant which is good news as it is a suburb of the city! Bullfighting was introduced to Mexico by the Spanish conquistadors. The Plaza Mexico in Mexico City is the world’s largest bullring with room for 50,000 spectators. Mexicans celebrate the Day of the Dead each November. Chocolate skulls are made for the spirits of the dead who are said to join their living families for a feast. Maize, one of the world’s most important crops, was first domesticated around 5000 BCE in the Mexican Gulf Coast. The world's smallest dogs come from the state of Chihuahua, where they were kept as pets by the Mayans. Fried grasshoppers are popular snacks in Tabasco state in the south. The Caesar Salad was invented and named after an Italian chef called Caesar Cardini who had restaurants in Tijuana Mexico and California in the 1920s. 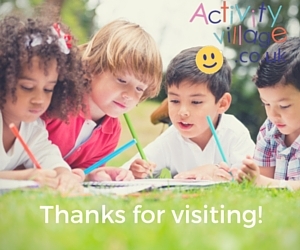 In Autumn millions of monarch butterflies migrate from Canada and the US to central Mexico. Numbers are falling sharply due to destruction of their milkweed food in the US and deforestation in Mexico. 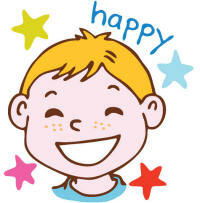 Chocolate was grown by the Mayans and was made into a spicy drink popular with kings and priests. Tomatoes come from South America and were eaten in Mexico by Aztecs named after native nahatl word ‘tomatl'. The first tomatoes were mainly small and yellow!